Contents: Black woman (2:40) -- The fox (2:34) -- Suite: Ancestors (87:34). 900 miles ; Red clay country ; Another man done gone ; No more cane on the Brazos ; Pretty horses ; Poor wayfarin' stranger ; 900 miles (reprieve) ; Shenandoah ; Can't keep from cryin' ; Trouble -- Ol' lady Sally (1:02) -- Amazing grace (2:02). Purchase link is for 1998 edition. Recorded at the Kerrville Texas Festival, 1996. Producer: Murray Krugman. Description: 1 sound disc : digital ; 4 3/4 in. + 1 insert. 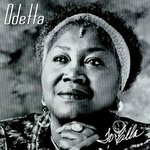 Odetta (2003). To Ella. Westminster, Vt.: Silverwolf Records.